Thomas de Hartmann was born in the Ukraine and was already an acclaimed composer in Russia when he first met Gurdjieff. He spent the years 19171929 as a pupil and confidant of Gurdjieff where at the Prieuré, he collaborated with Gurdjieff to compose the musical work that continues to inspire to this day. He later was one of the founding members of the Gurdjieff Foundation of New York. By his early twenties, Thomas de Hartmann was one of the best-known living composers in all of Russia. This informative biography of de Hartmann by John Mangan, the Dean of Jonathan Edwards College at Yale University, is reprinted from Notes: Quarterly Journal of the Music Library Association, by permission of the Music Library Association. This biographical sketch by Thomas C. Daly and Thomas A. G. Daly was originally published in Our Life with Mr Gurdjieff: Definitive Edition, London: Penguin Arkana, 1992, 277p. Written by Thomas and Olga de Hartmann, this account of the musical collaboration between Gurdjieff and Thomas de Hartmann was first published as Chapter 25 of Our Life with Mr Gurdjieff: Definitive Edition. 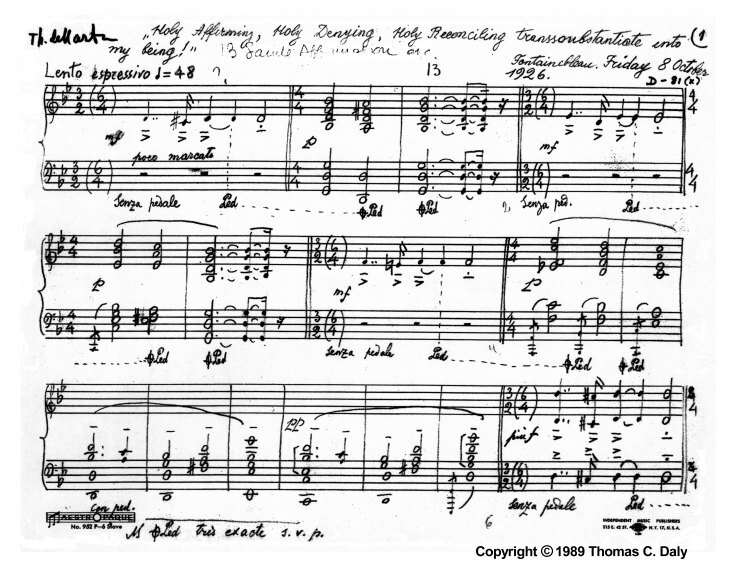 This first page of Holy Affirming, Holy Denying, Holy Reconciling is taken from de Hartmanns music manuscripts. It is also partially reproduced in the Triangle Editions record album and CD notes. Besides showing de Hartmanns elegant music calligraphy, it contains his English handwriting, and connects to expressions used in Beelzebubs Tales. Tom Daly read Ouspenskys In Search of the Miraculous on its publication in 1949, then had the good fortune to meet and befriend the de Hartmanns while they were living near Montreal in 1951. First published here, he describes the setting and impact of Thomas de Hartmanns 1954 talk to the then fledgling Toronto group. This essay by Laurence Rosenthal was originally published in Parabola Magazine, Volume XI (3) 1985, as a review of the four-record album brought out by Triangle Editions in 1985. Reprinted with kind permission of Parabola and the author. An inventory of recorded Gurdjieff / de Hartmann music is summarized.